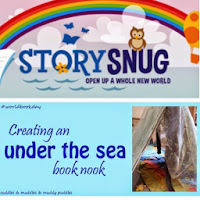 Today we bring you some ocean and sea themed books from Story Snug and a little peek at a cute book nook and some more book recommendations from Cuddles & muddles & muddy puddles. It's no secret that I love books and that I encourage T to read all the time, so I was delighted when Cuddles & muddles & muddy puddles and Catherine at Story Snug said they'd like to join us for our ocean activities month. Catherine has some lovely suggestions for books to accompany this theme, you can visit her blog here and see the lovely books she's recommending. Have a look round - there are loads of book recommendations to share with you little ones. 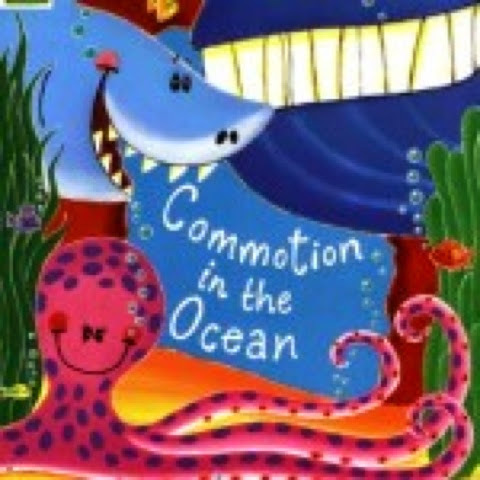 I particularly like the look of 'commotion in the ocean' and T and I are off to the library this week to have a look to see if we can find it! 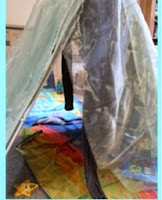 Cuddles & muddles & muddy puddles made this fantastic book nook in their cardboard den. I really love this idea and T and I will be definitely be making a book nook sometime, I can't wait to have somewhere to snuggle up and hang out with books! You can link to their post here. There are also some reading recommendations for 'under the sea' books! And you can see their cute little small world aquarium here. Have a look around whilst you are there, there's lots of great activities for toddlers. Thanks so much for joining us ladies, we've loved being able to incorporate books into our theme and really appreciate you helping out. We are off to find some books this week, what are you up to? Have you read any good books with your young ones lately? What a lovely idea to have an ocean themed month! We have a season ticket to the Oceanarium at Bournemouth; I might take a look at you Pinterest board and see if I can link a few bits together for a fun weekend!